Property Handbook Section 4 Lots, Lawns and Landscapes Policy- Muirfield Association, Inc. Lot drainage and grading must follow the master grading plan on file at the City of Dublin. Final grading of all lots, lawns and landscaped areas and any changes made thereafter must accommodate proper drainage. Each owner shall take care to assist in the natural flow of rain water from their lots. Owners must not impede the natural flow of surface water from/through their lots with landscaping or mounding or by changing the master grading plan. If a drainage assistance system such as a French drain, ditch, swale, dry creek, etc. becomes necessary, a plan must be approved by the City of Dublin and the Muirfield Design Control Committee (MDCC) prior to installation. Creeks and streams running through lots must be maintained in good condition at all times. Grass, weeds and other materials must not impede the flow of water. Vacant lots can provide natural beauty and open space. Owners must maintain built properties and vacant lots on a regular basis, keeping weeds, brush and high-growing grasses under control. Lots must be free of debris, hazardous trees and storage materials. Water may not pool or stagnate and must be drained to reduce mosquito infestation. During construction phase, properties must be kept free of weeds and trash. Construction debris must be confined within a trash enclosure and disposed of regularly. See the Home Exterior Accessories Policy for use of lawn furniture, lawn and landscape ornaments, bird feeders, statuaries, fountains, banners, flags or other outdoor décor. Lawns shall be planted according to good horticultural practices with acceptable grasses by hydro-seeding or sodding to produce a satisfactory stand of permanent grass. Mowing, trimming, weeding and edging are required to maintain lawns on a regular basis. Healthy, regularly-maintained lawns are more able to resist weeds. Grass length may be as short as 2” but not taller than 6” anywhere on the lot. Proper lawn care may increase the value of the property. If mowable areas are not practical for the topography of the lot, a request for an acceptable ground cover must be submitted to the MDCC for review. It is prohibited to store yard equipment, materials, supplies, tools, mulch, or any other item on the lawn or in landscape beds, including mulch bags, sand, top soil, stone, timbers, yard waste, pots, weed cloth and edging materials. Hardscape areas such as decks, patios, walks, driveways, landscaping timbers and ties as well as retaining walls must be kept in good condition at all times. They must remain free of debris, tripping hazards, peeling, cracking, weeds, algae, stains, scaling and any other type of deterioration. New Construction Landscaping must include adequate materials at the front, side and wrapping to the rear elevations of the home as designated by the MDCC. Purchasers of built properties in Muirfield Village are responsible for conditions at time of purchase and must bring the property into compliance should there be pre-existing violations. Whether installing new or removing or renovating existing landscaping, the MDCC must approve additions and changes prior to any work beginning. Applications for approval can be found here. It is important to include specific information in your application. Landscape design must coordinate new plant needs with the climate, soil, orientation, drainage and existing vegetation, as it relates to the natural resources and man-made improvements. Driveway entrance plantings must provide permanent, clear, safe sight distance for all vehicles. Plants must be hardy and pest-resistant. They must be well-formed and free of disease and infestation. The quantity and variety of all new plant materials must be sufficient to fulfill the needs of the property. 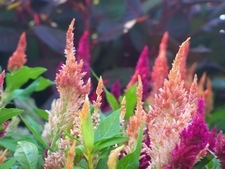 Plants must be of suitable size, color and texture for the area and spaced to accommodate normal growth as interpreted by the MDCC and based on professional site design analysis and customary planting treatments of Muirfield Village. Property-defining plantings are not permitted. Landscape timbers, edging pavers, and other means of defining plant beds may be permitted with prior review and approval of the MDCC. Avoid planting trees, shrubs or large perennials in easement areas or near underground drainage and utility lines. Where utility boxes are present, utility companies require a minimum 10 foot clearance from the side of the box with doors. Other sides require at least three feet from the unit. Property owners are responsible for replacing plant materials or underground fencing located in the utility easement areas, if damaged during utility work. All areas of disturbed earth shall be restored with an adequate amount of soil and sodded or hydro seeded with a quality grass seed. 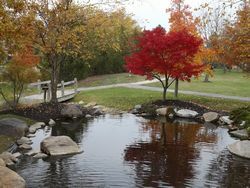 Trees are a crucial element to the natural beauty in Muirfield Village and require special consideration. Before trees are planted or removed, a request must be submitted to the MDCC for approval. The Committee will consider the species, size, type, and location of replacement trees. Property-defining or regimented tree plantings are prohibited. Planting in groupings or clumps will obstruct less appealing views while providing a more natural presentation in accordance with the original intention of open, flowing vistas, with one yard blending into another. The original concept for this community combines good design with respect for the natural beauty of the land. Retaining the woodland is as important today as it was in the beginning development. 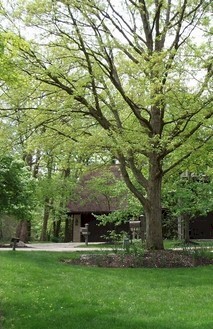 Property owners are responsible for the maintenance of trees on their lots. This includes all aspects of the trees from clearing fallen branches and bark, treating diseased trees and removing dead trees. Association staff performs continuous tree maintenance on all common elements. The Association appreciates immediate notification when a resident observes a problem tree, hazardous situation, or a safety issue on common ground. Tree Removal requires MDCC approval in all cases. The Warranty Deed provides that trees larger than six inches caliper may not be removed from the property unless approved in writing by the MDCC. In some cases, dead trees may present a safety hazard and emergency removal may be necessary before obtaining written approval. The Association will work with property owners in these types of situations when notification is made to the Association office. Removal of living trees will be considered if there is good reason. In some instances, a tree can be removed without replacement at the discretion of the MDCC if doing so adds benefit to the existing trees or surrounding landscape. In most cases, when a dead tree is removed, the MDCC will require that a new tree be planted to replace it. 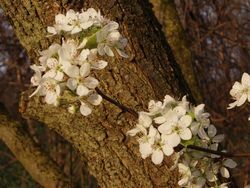 There are exceptions which must be explained on the tree application and will be taken into consideration by the MDCC. The Committee will expect a reasonable explanation for those trees not planned for replacement. Decisions are made on a case-by-case basis and at the sole discretion of the MDCC. Tree Stumps must be ground out to grade and the area restored when a tree has been removed. All portions of the removed tree -wood chips, limbs, trunk, leaves, etc. must be removed from the site and disposed of properly. Only a limited amount of firewood (no more than one and one-half cord of cut, stacked firewood) may be stored on the property. Replacing Trees after the removal of a tree requires thoughtful planning. When planting trees, take into consideration the location and growth of the selected tree species in order to manage the rooting system and future size of limbs within your own lot lines. Neighboring properties own the air space on their side of the lot-line and have the right to shear, trim or prune the tree umbrellas that extend onto their lots. Encroaching onto neighboring properties to access an area for installation or removal of trees requires permission of the property owner. Firewood must be placed in an inconspicuous location at the rear or side yard, stacked neatly and kept in good condition at all times. To be considered firewood, wood must be of a consistent size commonly used in a moderate-sized fireplace. Logs can be no larger than 8” in diameter. If wood pieces are larger, they must be split and cut into pieces no more than 30” long. 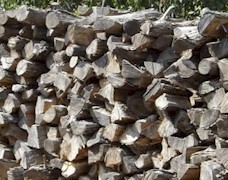 The amount of stacked firewood cannot exceed 1 1/2 cord, measuring approximately 4’x4’x12’. Tree parts such as fallen limbs or branches must be removed from the site. Small pieces of wood kept for kindling must be cut and tied into bundles no more than 12” in diameter. No more than 5 bundles may be kept on the property and must be stacked with the firewood. Large pieces of trees are not considered firewood and may not be stored on the property. Protective tarps used to cover stacked firewood must be earth-tone in color. When dead trees are removed from the common elements, the Association cuts and splits the trees into firewood and offers this firewood for sale to the residents in half and full cord increments. The maintenance staff will deliver and stack the wood at your direction. Deliveries usually begin in November and continue throughout the winter months. Contact the Association office at 889-0922 for availability and pricing or to place your name on the waiting list. You may also order firewood online in the Members Area. Gardens are part of the lawn and landscape. Before planting a garden, submit a request to the MDCC for approval. Approved gardens must be maintained in an orderly, weed-free manner on a regular basis to remain in compliance. The application can be found here. Yard waste includes any natural material collected during the care of lots, lawns and landscaping. The City of Dublin’s chipper service/composting program will collect yard waste placed at the curb on collection day only. Setting yard waste out on any day except collection day is prohibited. Tree limbs and branches will be picked up as part of the City’s Chipping Service provided the limbs are bundled in 4’ lengths with the cut ends toward the street. Cardboard boxes used to contain yard waste or refuse will not be picked up if they become wet. Dumping yard waste anywhere on Muirfield common ground or within the City public areas is prohibited and will be considered illegal dumping. Offenders may be prosecuted. Contractors - The Association does not provide recommendations for local vendors; however, Muirfield residents have created a list of vendors to its members. The Muirfield Village Vendors List is located in the Members Area. Property owners are responsible for the actions of hired contractors. Contractors may not access, damage or remove common elements during installation or maintenance of lot or home projects. Any common elements damaged by contractors shall be the owner’s responsibility to restore to original condition. The owner is responsible for having acceptable repairs/restoration made in a timely manner. If not completed in a timely, acceptable manner, legal action will be taken to seek compliance. Insurance - The Association provides coverage for all common elements, buildings and facilities owned by the Association. Each owner is responsible for obtaining insurance coverage on his/her home and lot. Only the Board of Directors may submit claims against the master insurance policy.